MIT engineers have designed a robotic glider that can skim along the water's surface, riding the wind like an albatross while also surfing the waves like a sailboat. The albatross does well with the former, as its wings provide natural lift, though it flies between air layers with a relatively small difference in windspeeds. Meanwhile, the sailboat excels at the latter, traveling between two mediums of very different speeds—air versus water—though its hull creates a lot of friction and prevents it from getting much speed. Bousquet wondered: What if a vehicle could be designed to perform well in both metrics, marrying the high-speed qualities of both the albatross and the sailboat? 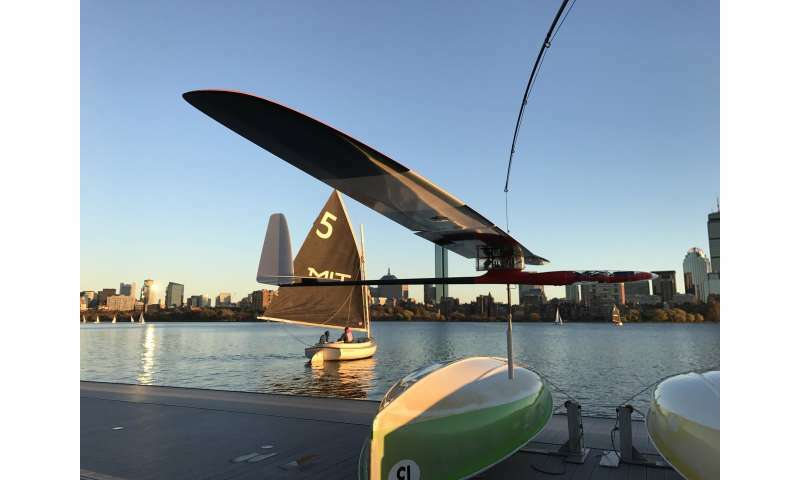 The researchers decided to test this "critical maneuver"—the act of transitioning between flying in the air and dipping the keel down to sail in the water. Accomplishing this move doesn't necessarily require a sail, so Bousquet and his colleagues decided not to include one in order to simplify preliminary experiments. "We were flying very close to the surface, and there was very little margin for error—everything had to be in place," Bousquet says. "So it was very high stress, but very exciting."